There aren’t many reasons to mess with the classic s’mores flavors of graham crackers, chocolate, and marshmallows … except when cake is involved. 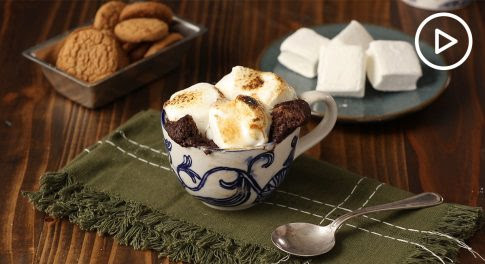 Thanks to a gluten-free baking mix and a few pantry staples, this dessert-in-a-mug can be whipped up in no time and cooked in 1 minute flat. It’ll definitely give you those campfire vibes without leaving the kitchen. Stir the cake mix, egg, water, coconut oil, sea salt, and vanilla in a microwave-safe mug until smooth. Place frosting in the center of the cake and push it into the batter to cover. Sprinkle crushed cookies on top of the batter, then gently arrange marshmallows on top of the cookies. Microwave for 55 to 60 seconds. Using a torch, heat the marshmallows until golden and charred. Let cool for a few minutes before eating.